In July 1832 Moriarty was appointed port officer, first at Launceston and then at Hobart. During his first three years in office he started the survey of the Actaeon Reef in the D'Entrecasteaux Channel where there had been several recent wrecks. He retired before the survey was completed but was soon asked to resume the work, although in October 1836 he had become assistant police magistrate at Westbury. He was appointed a coroner for Van Diemen's Land in April 1837 and, on the resignation of Captain King, resumed duty as port officer of Hobart. In June 1841 the Legislative Council awarded him a gratuity for his useful services as port officer and for his generous assistance to distressed passengers and crews. Moriarty was a prime mover in forming the Merchant Seamen's Institution and a founder of the Hobart Town Infant School of which he was president for many years. He was also an active member of the Church of England. He died in office on the 26th March 1850. 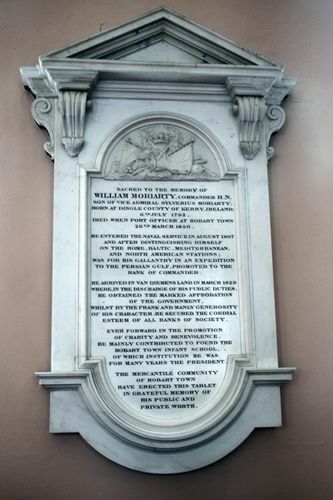 The handsome mural monument to the memory of the late Captain Moriarty, R.N., for many years Port Officer in Hobart Town, is erected in St. George's Church, Battery Point. It was executed in fine statuary marble, by Messrs. Tiper & Son, of London, with carved trophies over inscription, and is a very appropriate memorial to the memory of one who was esteemed and honoured, both for his private benevolence and manly virtues, by every individual in this community. The total expenses incurred for the monument in London, its erection by Mr. Barclay in the church and incidental charges and expenses, amounted to £174 14s. 5d. The Courier (Hobart), 9th June 1855. Born at Dingle, County of Kerry, Ireland, 6th July,1792. Died, when Port Officer at Hobart Town, 26th March, I860. Was for his Gallantry in an Expedition to the Persian Gulf promoted to the Rank of Commander. He secured the cordial esteem of all ranks of society. Ever forward in the promotion of Charity and Benevolence, he mainly contributed to found the Hobart Town Infant School, of which Institution he was for many years the President. The Mercantile Community of Hobart Town have erected this Tablet ln grateful memory of his Public and Private Worth.